Bentonite can be applied in animal nutrition to adsorb mycotoxins and reduce mycotoxin bioavailability from contaminated feeds in the animal’s gut. It is a fine clay material mined from the earth. Most bentonites are formed by the alteration of volcanic ash in marine environments and occur as layers sandwiched between other types of rocks (as can be seen in the image above). Bentonite is defined as a naturally occurring material that is composed predominantly of the clay mineral smectite. The Cation Exchange Capacity (CEC) and the specific surface area of smectites are considerable larger than other families of clays. Their absorption capacity is as much as 8 times greater than other clays. Bentonites are colloidal and plastic clay materials composed largely of montmorillonite (a species of dioctahedral smectite). The properties of bentonites can vary considerably depending on geological origin and any post-extraction modification. Their individual characteristics have a marked bearing on their economic use. Despite the generic nomenclature of commercially-available bentonite, several physicochemical properties have been identified as having a possible correlation with adsorption of mycotoxins and might therefore be used to categorize the different available types. Adsorption to clays is not limited to the surface of the clay particles, but extends also to the interlayer space of the clay. This interlayer space, characterized by the d-spacing, can be determined with X-ray diffraction (XRD) and is restrictive for the formation of one or more adsorbent layers. This space can increase if the clay swells, thereby increasing the number of binding sites. In vitro adsorption tests have shown that there is a positive correlation between zearalenone adsorption and d-spacing in commercially available products based on bentonite, i.e. large d-spacing was associated with higher % adsorption of zearalenone. (De Mil et al 2015). The d-spacing ranged from 9.2 to 21.5 (10-10 m) in 16 different products containing bentonite material, showing the large variation in material out there. Recent scientific data (Vekiru et al 2015) evaluating different types of bentonites for the in vitro adsorption efficacy relating to aflaxtoxin B1 has shown that most of the tested Ca- or Na-bentonites were effective. However, cis-bentonites were more effective than trans-bentonites. Dioctahedral smectites that are found in bentonite have one vacant position in the octahedrons because one of the three symmetrically independent octahedral positions is not occupied by cations, resulting in a vacant site. The disposition of the hydroxyl groups in the octahedral sheet with respect to this vacancy defines the configuration cis- or trans-vacant. In vitro experiments have been developed as a way to effectively pre-screen adsorption agents before testing in animals. However, results between in vitro and in vivo efficacy can vary significantly. Even among bentonites with high in vitro adsorption efficacy, there are differences in in vivo efficacy indicating that in vitro testing alone is not adequate for evaluation of adsorbents. Currently 1m 558 bentonite has been approved as a substance for reduction of the contamination of feed by mycotoxins (aflatoxin B1) for pigs, poultry and ruminants according to EU regulation in the EU register for feed additives. The approval is based on safety of using the product and proven in vitro and in vivo adsorption efficacy of Aflatoxin. At current recommended maximum inclusion level of this bentonite in animal feed, the binding of vitamins and minerals is insignificant. 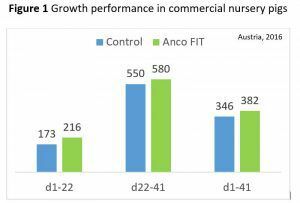 Applying Anco FIT in antibiotic-free nursery diets in a field trial under commercial conditions improved growth performance by >20% in the first 3 weeks and by 10% overall (Figure 1 below). Pig producers also reported a reduction in the amount of medication required for nursery pigs. Weaning is a particularly stressful period for the pig and since the digestive system is not fully developed yet, the pig is also more susceptible to nutritional stress factors including less digestible nutrients and mycotoxins. This is particularly evident, when diets are fed antibiotic-free. In the early stages post weaning, growth and development of the pig are driven by feed intake in a linear fashion. Scientific studies have shown that for every 0.1 kg extra feed per day during the first week post-weaning, body weight increases about 1.5 kg at the end of the fourth week post-weaning. Feed intake in the first week post-weaning, also has consequences for later stages of growth. In studies conducted at Kansas State University, pigs that maintained or lost weight during the first week post-weaning required 10 extra days to reach market weight, compared with pigs that gained about 0.25 kg/day during the same period. Wilcock (2009) reported that for every 17g/day in the first twenty days post weaning, an increase of 1kg at slaughter can be expected. Commercial nursery pigs were fed antibiotic-free diets containing up to 36% corn, some wheat and some barley. Pigs did not receive medication. Average weaning weight was 9.3kg. Nursery pigs fed Anco FIT in the diet gained considerably more weight compared to the control pigs, particularly in the first 22 days. This advantage was maintained at 41d weight (Figure 1 below). Read more about pig production in Austria: here. Pork producers certified by AMA (Agrarmarkt Austria Marketing) produce pork of the highest quality standard in Austria (see more info below). What really matters to them in pig production is high performance, quality and flexibility in production, whilst feeding antibiotic-free diets and meeting the top demands on animal production from consumers in Austria. What does the AMA seal approval stand for? • Meet the highest quality standards. • Transparency: It guarantees that foodstuffs can be traced to their source. • Farmers, processing plants and retailers certified by AMA conform to standards, which are stricter than required by law and are monitored by independent testing centers. • Animals raised and slaughtered in Austria. • Antibiotics are only allowed for treatment and only with prescription from vets. If animals are treated with antibiotics withdrawal times are twice as long as what is required by law. • The majority of feed comes from home grown cereals. Any feed supplements need to be bought from AMA certified feed manufacturers. Currently there are 1800 pig producers in Austria, that are producing according to AMA standards. The total number of pig producers in Austria is around 30 000. The agricultural sector in Austria is shaped by small family farms. • 14% have more than 50 ha. (Federal Institute of Agricultural Economics 2011). The current economic value of pig production in Austria is 860 Mio Euro (Bauernbund 2015).